In this age of Botox injections, dermabrasion, chemical peels and other therapies designed to retain the youthful appearance of the skin, it is heartening to know that Ayurvedic skin care protocols have been helping people to maintain beautiful, supple and lustrous skin for ages without toxicity or discomfort. With a few minutes a day and supplies that you, most likely, already have in your kitchen, you can take steps towards creating the skin you that desire. The first thing to remember is that your skin is an outward manifestation of the internal state of your body. Good diet, regular routines and adequate rest are most beneficial in maintaining the health of the skin. Once you have attended to creating internal balance, attention may be turned to the external surface...the skin. Nutrients are absorbed through the skin directly into the bloodstream, so it is important to read the labels of any products that you apply topically and consider only applying substances that are natural and organic. Using a salt scrub may be just the thing to begin your journey to more radiant skin; a salt scrub is used in place of a drying soap and gently exfoliates the skin while leaving a fine layer of oil on the surface of the skin. This oil retains moisture and protects the surface of the skin. Ayurvedic theory states that the oil will also have a beneficial effect on the stability of the nervous system. You’ll notice that the scent of the essential oils stays with you throughout the day, serving as an aromatherapy treatment as well as a skin replenisher! 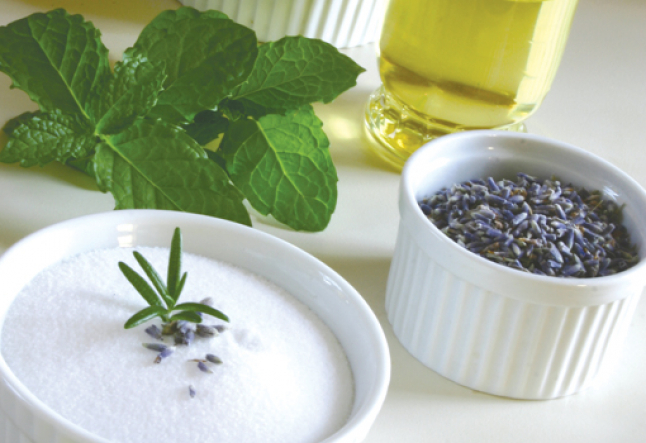 To make your own salt scrub, gather 1 cup fine sea salt, 1⁄4-1/3 cup oil, and 20-30 drops of essential oils of your choice. When adding essential oils to any formula, start with the lesser amount and test the product on your skin before adding more oils to the mix. Store the salt scrub in a shatterproof container if it will be kept in the shower. For Vata nature or imbalance, begin with 1/3 cup sesame oil, salt and essential oils. A nice blend of essential oils is 20 drops of lavender and 5 drops of patchouli. Other scents that pacify Vata include sandalwood, sage, rose, clary sage and lemongrass. For Pitta nature or imbalance, begin with 1⁄4 cup coconut or olive oil, salt and essential oils. A nice blend of essential oils for Pitta is 15 drops chamomile, five drops lemon balm, one drop peppermint. Other scents that pacify Pitta include sandalwood, rose, carrot seed, and calendula. For those with dry skin and signs of premature aging, consider the following evening protocol. After washing the face with a mild soap to remove all dirt, oils or makeup, apply fresh aloe vera gel as a toner. The gel is astringent, assists in tightening the skin and helps to retain moisture. When this has dried, apply a small amount of ghee or coconut oil to the skin and massage it in before retiring. A nourishing treatment for irregular skin pigmentation is a paste made of five ground almonds, one teaspoon fresh cream and a few drops of lemon juice may be applied to the face and neck. After about fifteen minutes, wash this off and follow the above evening routine. The key to beautiful, radiant skin is the same as the key to vibrant physical health...live in balance, maximize harmonious activities, and minimize stressors. The suggestions given here are one way to nurture yourself physically so that you may become more connected to the beautiful person who resides within you. This person is always in a state of health, grace and radiance.